I find inspiration to come in many forms. When I was coming up with Rayguns and Rocketships, I knew I wanted to set the game during the golden age of science fiction – 1936 to 1953. While I like 1950’s science-fiction with its UFOs and little green invaders, I felt that that era was already well represented in board games. 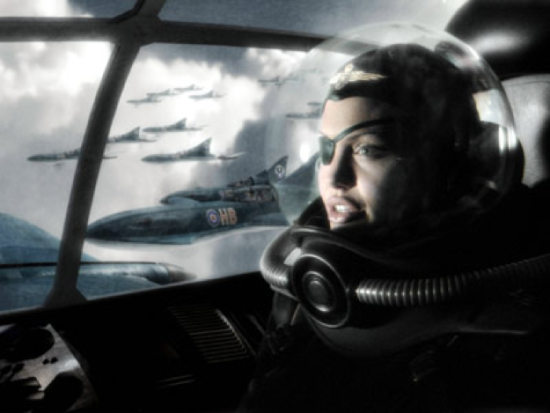 I wanted to do something different and looked all the way back to the roots of modern science-fiction, to focus on the sub-genre space opera. 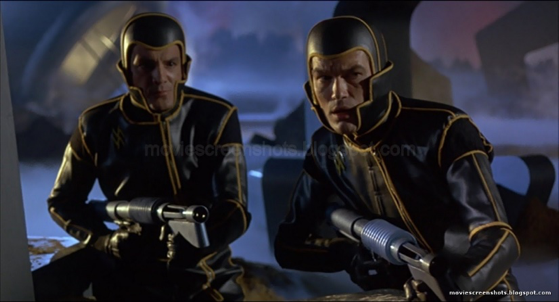 When I was a kid, I learned about space opera through Star Wars. I read that the genre had inspired George Lucas and I soon discovered the movies, books and comics that had inspired him. I wasn’t the only one as many other creators since then have also discovered space opera. Their creations served as further inspiration in creating the galaxy of Rayguns and Rocketships. Over the next few articles, I will share a few of those inspirations with you, so you can learn more about this influential period in science-fiction. Inspired by the 1930’s comic strip, this 12-part serial features the adventures of “Flash” Gordon, an earthman who finds himself in another universe filled with wicked villains, strange aliens and marvelous rocketship technology. He quickly makes an enemy of Emperor Ming, a despotic ruler of the universe. In this cliffhanger filled serial, Ming has unleashed “the purple death” – a terrible plague that threatens to wipe out all life. Flash joins up with Professor Zarkov and love interest Dale Arden to save the universe and thwart Ming’s plans. Will he succeed? When George Lucas failed to get the film rights to Flash Gordon, he made his “own damn Flash Gordon” – a little film called Star Wars. 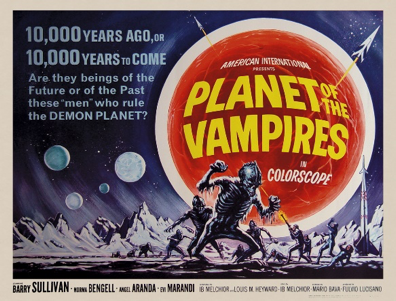 Producer Dino De Laurentiis capitalized on the sudden interest in science-fiction movies and created a classic. 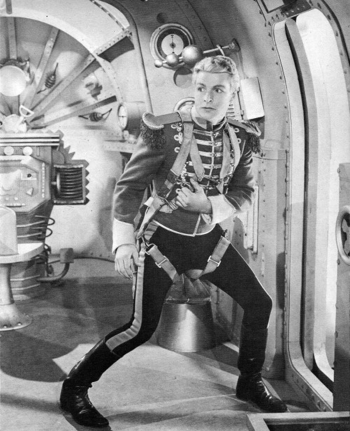 Flash Gordon walks a fine line between science-fiction spectacle and cheese. 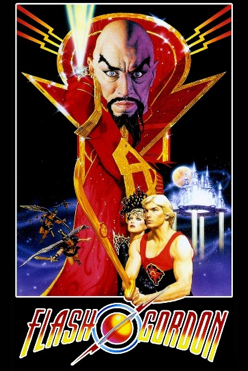 Sam Jones is great as the heroic Flash, Max Von Sydow drips menace as Ming the Merciless. Topol, Brian Blessed, Timothy Dalton and Peter Wyndgarde all take turns chewing up the scenery as Professor Zarkov, Prince Vultan, Prince Barin and Klytus. And let’s not forget the unforgettable soundtrack by Queen. The attack on the rocketship Ajax is one of the inspirations for Rayguns and Rocketships’ boarding actions. 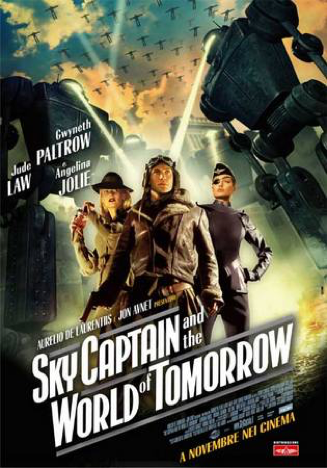 Sky Captain is an airborne hero who stumbles upon a mysterious plot involving kidnapped scientists. Kerry Conran’s love-letter to pulp sci-fi came out of nowhere but it was chockful of references to the classics of the 1930’s and 40’s including Max Fleischer’s Superman cartoons, King Kong, and Airboy comic books. My favorite nod is Angelina Jolie’s spacesuit inspired from Wally Wood’s Weird Science comic book covers. She looks like she could be leading a crew of Astro-Rangers in that get-up. 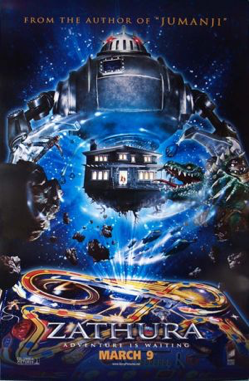 Based on the children’s book, Jon Faverau (Iron Man, Elf) directed this movie about kids who play a magic board game that send their house into outer space. 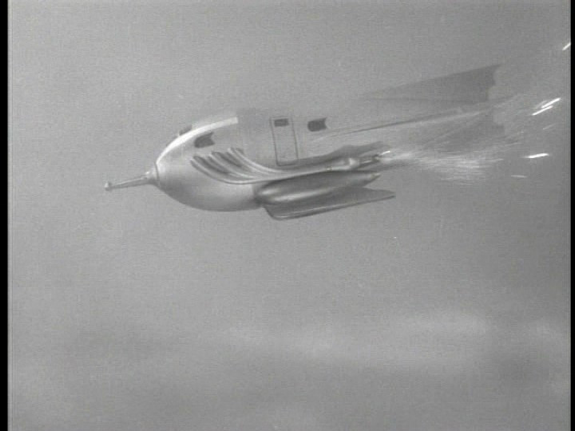 The Zorgon are one of the inspirations for Rayguns and Rocketships Zard, The way their rocketships fly and shoot in the film are exactly how I imagine Rayguns and Rocketship’s craft move in the game. Do yourself a favor and check out these great movies. They will definitely get you in the right mood to play a game of Rayguns and Rocketships!